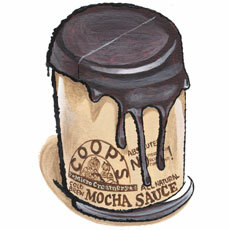 Coop's Mocha Chocolate Sauce for sale. Buy online at Zingerman's Mail Order. Gourmet Gifts. Food Gifts. Marc Cooper is an ice cream fanatic and his microcreamery churned out some of Boston’s best ice cream for a decade. Unhappy with the sauces he was sourcing (and to keep his staff busy in the cold months) he created, bottled and sold his own hot fudge. Then salted caramel sauce. Now it’s this perfectly balanced, never too sweet mocha sauce. This rich topping is made from cold brewed coffee, which is naturally sweet, never bitter, and highlights the chocolate flavor. A new addiction for ice cream lovers. "Cooper takes a smooth Arabica cold brew coffee and blends it with the natural cocoa powder and pure chocolate he uses for the ultra-rich hot fudge. Intensely flavored, not too sweet, it’s best served warm. You may want to drizzle it on nearly everything."